The hotel has 277 rooms and 24 suites, equipped with bath, telephone, refrigerator and TV. Hotel Marina Lido wing: Hotel Marina has 12 single rooms and 36 suites in its Lido wing. There are apartments with two rooms and single rooms in a 3-storey building offering high quality services for families and business travellers. • Playground, activities for children, kid's' menu, highchair, cot, etc. 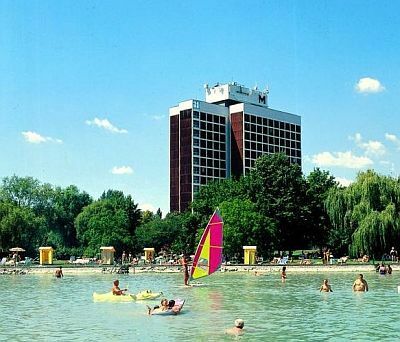 Hotel Marina Balatonfured offers 5 function rooms with 8 to 100 seating capacities. Accommodation and meal are free of charge for 1 or 2 children up to the age of 6 (up to 5,99) sharing the room with their parent(s). Third bed in the room is child-bed or extra bed.